Circa late 1840's, the elegant tapered Irish Crochet coat has a superb design. A striking combination of Irish Crochet designs are used, with a dense Irish Crochet design of pretty assorted motifs enhanced by large Irish Crochet meandering vines accented with three-dimensional flowers. The coat belonged to a Mrs. O Harry Archer of NYC, given to Mrs. Elbert H.Griffin of Oyster Bay, then passed to niece Dr. Dorothy Dean, who is listed in the Who's Who of America. The design is graceful and elegant! A beautiful bodice and a skirt made with watered silk. The subtle large roses are quite delightful, it is extremely rare to find a silk ensemble like this in such good condition. Part of a deacession from a prominent historical mansion in Philadelphia. 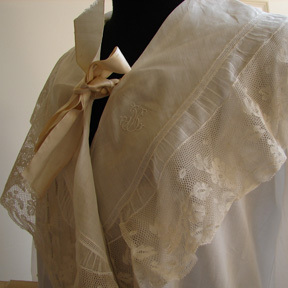 A frothy Edwardian whitework bed jacket with original ribbon. 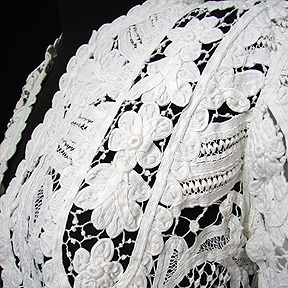 The combination of Valencienne lace and fine raised whitework is quite delightful. 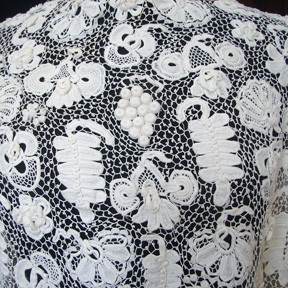 The jacket is entirely worked in embroidery with original ribbon and is edged entirely with Valencienne lace. A lovely frothy bedjacket, one of the very best I have come across. Circa late 1800's - early 1900's, a superb Irish crochet skirt with a lovely design and longer trained skirt at the back. 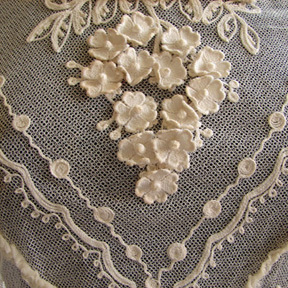 Ideal for a wedding dress or to use as part of an ensemble. 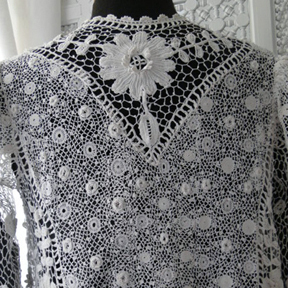 A lovish and ornate design in combination with good quality Irish crochet. 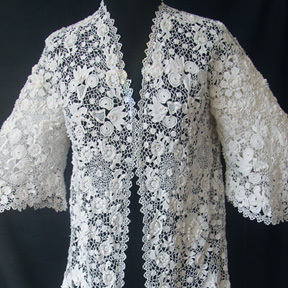 A very stylish Irish crochet lace jacket with a ornate design. Large three-dimensional flowers are surrounded by smaller flowers and leaves that also has the traditional raised work. The overall shape of the jacket is enhanced by the gentle tapering scalloped sleeves. 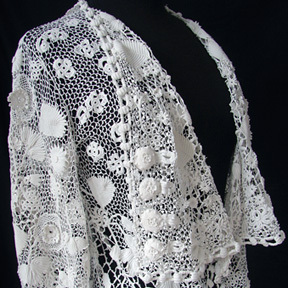 A very beautiful Irish crochet jacket with good quality workmanship. 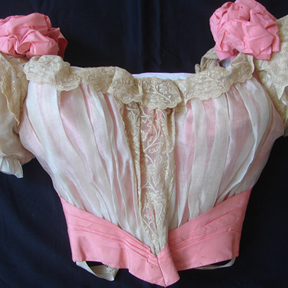 A gorgeous ladies muslin bodice lavishly decorated with two large pink silk ribbon rosettes on the shoulders, and matching ribbon around the waist. 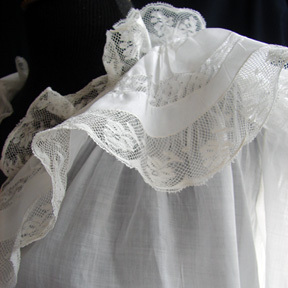 A fine dresden style lace ruffle is inserted down the center and around the neckline. A very beautiful bodice! Circa late 1800's, this wonderful cut velvet long coat is quite stunning. 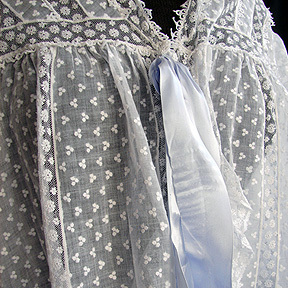 The bodice has stays and is lined with a waxed chintz, the longer part is lined in blue. Large ornate roses and meandering vines and leaves throughout hte coat are quite lovely. 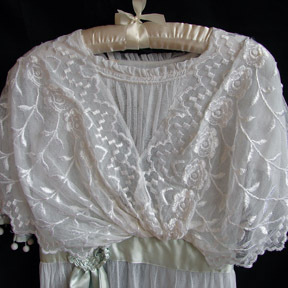 Circa 1900, a very pretty white lace dress with a blue silk ribbon rosette and sash. Measuring apprx. 53" long, 18" across chest, 7" across armhole, and 23" around waistline. The dress is in good condition. Circa early 1900's, a lovely ladies two piece dress with a lovely combination of roses and lace. The design in the net of muted roses, swags, and bows are lovely. A delightful concoction and extremely pretty, the combination of florals and lace is quite charming. Circa 1900, a lovely two-piece ladies ensemble with the finest spotted lawn material. The spotted lawn is combined with tiny insertion lace and silk ribbons. A high neck collar, leg o' mutton sleeves, and a petticoat which adds volume to the skirt produce a delightful concoction. A lovely ethereal Edwardian ladies gown! 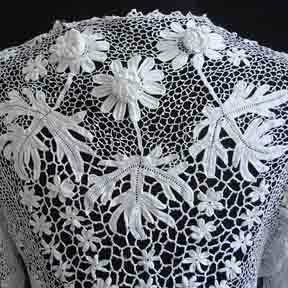 The ensemble consists of handmade Battenburg lace over a fine layer of watered floral net. The combination is enchanting, with the pale pink and rose colors adding delicacy to the Battenburg lace. A wonderful ensemble! 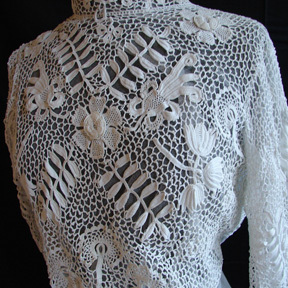 A lovely period Irish crochet blouse with a net lining. Measuring approximately 24" long from shoulder, 14" around neckline, 19" across chest, and almost 9" across armhole. The waistline measures approximately 26" and has a drawstring at the back. In very good condition. 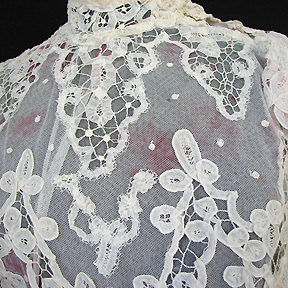 Circa 1900's, a fine Edwardian handmade battenburg lace jacket with a bold lace design. The design is quite ornate with fine three-dimensional raised flowers, and a graceful gently flared back. A lovely frothy fine lawn nightgown with masses of pintucking and Valencienne lace. The quality of the workmanship is quite superb, pintucking has been worked perfectly, and the Valencienne is quite exhuberant. 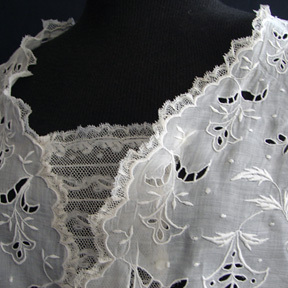 A gorgeous Edwardian spotted lawn peignoir with Valencienne lace insertions and also edged with more Valencienne lace. This is one of the most beautiful examples of this period. Extravagant, ethereal, and truly elegant, a wonderful piece for the collector. Circa 1830-60, a lovely two piece silk wedding ensemble with a lovely bodice that has ruched sleeves and roleaux work. The silk skirt has a longer train at the back. The bodice is quite superb. A very ornate Irish crochet blouse with a bold design of large flowerheads with raised work. 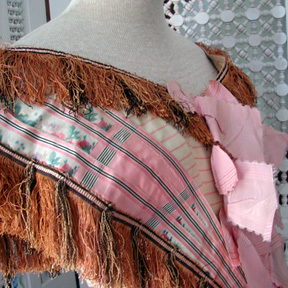 There are tiny Mother of Pearl beads at the back, and a bobbin lace edging on the sleeves and wasteline. 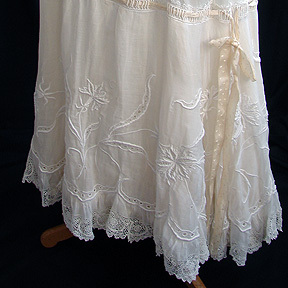 A lavish Victorian or Edwardian silk and lawn petticoat. 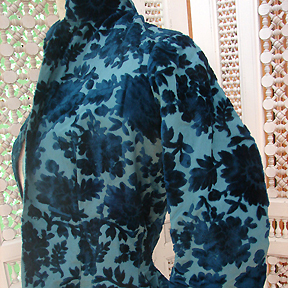 The silk even has a fine silk chiffon layer over it. A truly stunning petticoat, the satin-stitch raised embroidery is superb, both in design and quality of workmanship. Embellished with a original ribbon and pretty Irish crochet scalloped edging. A stunning original petticoat. A lovely lawn Edwardian tea gown with masses of Valencienne lace. A very pretty wearable frothy gown that has a beautiful design and quality workmanship. A good size on this tea gown, a very pretty and wearable gown. The dress has lovely tiny lace covered buttons. 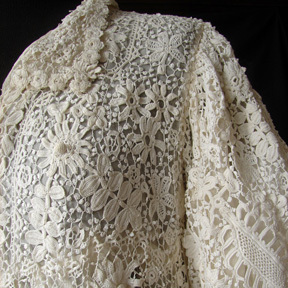 A stunning Irish crochet jacket with a elaborate design. Ornate leaves and flowers with masses of three-dimensional raised work on the flowers. 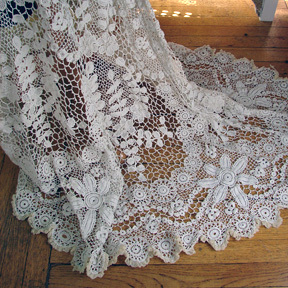 The design was well thought out and the quality of the Irish crochet work is quite excellent. In good condition. 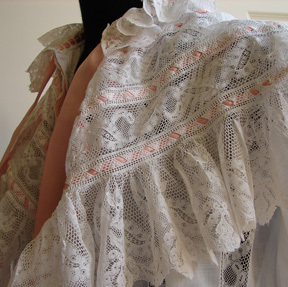 A beautiful floating ladies peignoir with masses of Valencienne lace. 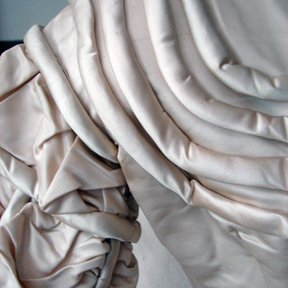 Truly romantic and graceful, wonderful frothy gowns like this have rarely survived. A wonderful item to wear or perfect for theatre wordrobe. A opulent gown! Circa 1890 - early 1900's, a wonderful Irish crochet coat with a lovely tight design of raised flowers and leaves. The coat has good volume and tapers to apprx. 50" at the back. Extremely wearable and a superb example of the best of Irish crochet. A beautiful coat with great style! Circa 1890-1900's, a rare and opulent wedding ensemble. There are two pieces, a elegant and graceful long skirt with a flowing longer flared back, and a period high-necked blouse. There is masses of three-dimensional work and the workmanship is of the highest quality. A wonderful item for the Irish crochet enthusiast as these items rarely appear on the market, also gorgeous outfit for the bride. 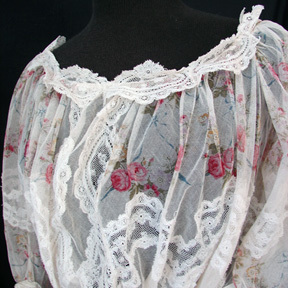 A cream Tambour lace blouse and skirt, with a lovely three-dimensional design of flowers. The outfit fits a size 8 perfectly. A lovely dress for a wedding, a small alteration on the neckline would greatly enhance the outfit. Good condition. A gorgeous Irish crochet shaped coat with collar and gently flared back. The quality of Irish crochet is excellent, and the coat has a lovely shape and a flowing style. Versatile and easily worn, a wonderful example of a Irish crochet. Circa 1890-1900, A wonderful frothy lace nightgown with masses of Valencienne lace on the bodice, collar, and also the sleeves. A crown with the initials "EVT" is worked on the side of the gown, which usually meant that an item belonged to a Royal family member. Measuring approximately 58" long, 22" across chest, 9 1/4" across armhole, and 14" around neckline. Good condition. 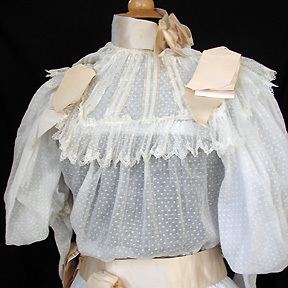 Circa 1890, A lovely matching set adorned with Valencienne lace and ribbons. 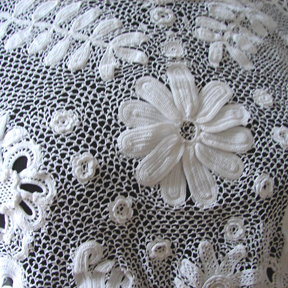 There is matching Valencienne lace on the hemline of the peticoat. 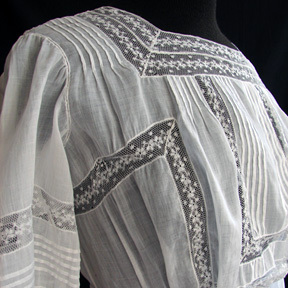 A finely worked whitework monogram is on the side of the collar. Measuring 55" long, 9" across armhole, and 24" across the chest. In good condition. 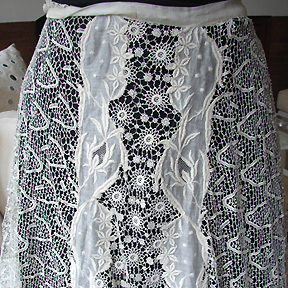 Circa late 1800's-early 1900's, a very beautiful lace skirt panel with a extremely ornate design. Raised satin stitch embroidery in the lawn are enhanced by fine Valencienne lace fillings. A wonderful skirt panel finished on all edges with a longer train at the back of the skirt. 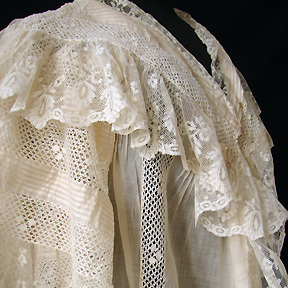 Circa late 1890's - 1900, a wonderful lawn petticoat with masses of ornate Valencienne lace, pin tucking, and drawnwork. 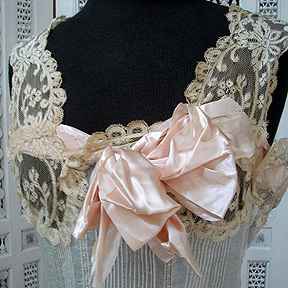 The original silk ribbons are on the bodice and skirt. A lovely example of Belle Epoque lingerie, lavish and ornate in every respect. Part of a prominent Philadelphia historical deaccession, a perfect addition to any clothing collection.